Bring your group to our campus for a custom retreat! 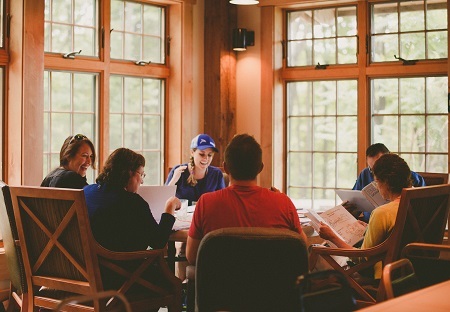 A Highlights Foundation custom retreat can take any form you’d like: just bring your critique group, friends, employees, book club–whatever group of people you’d like to spend creative time with. We’ll take care of the details so that you can focus on your work while surrounded by creative companions. Lovely outside areas for sitting, writing or walking. You’ll get valuable independent creative time plus the opportunity to share insights and challenges with your group. Visiting groups have organized daily critique sessions, evening readings and walks around our campus. You’ll love feeling like you have the place to yourself! The cost is $149/night per person. Want more from your retreat? Contact Jo Lloyd at 877-288-3410, or via email, to ask about pricing for extras. Our Lodge has eight bedrooms with private baths; a microwave, fridge, beverage and snacks; a living room space for gathering; and large tables for critiquing and working together. Our historic farmhouse–home of the founders of Highlights magazine–has five bedrooms with private baths; a full kitchen; a cozy living room; and a dining area for gathering around a table. Our cozy cabins have modern facilities and are writer-ready with desks, chairs, and filled bookshelves. Everyone who visits raves about the food, and with good reason: farm-style meals are prepared by a top-notch chef and will nourish your group during your stay. Call Jo Lloyd at 877-288-3410, or email her at Jo.Lloyd@highlightsfoundation.org. 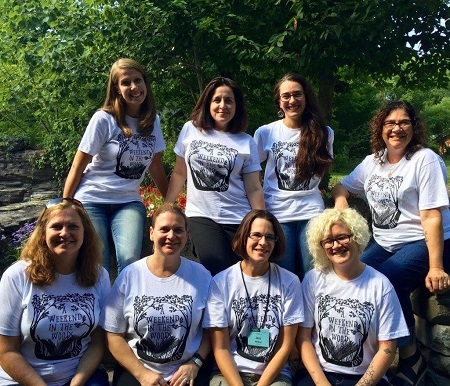 "I’ve gone to Highlights with my writers’ group for many years now. It’s the perfect combination of solitude and community. We stay for about a week in the Lodge, filling up every room. We work all day, with breaks for meals–which we eat together in the small dining room. There is no small talk at our meals! Or ever. That’s the beauty of going away with people you know. You can stay in your writing head as much as you want. When we do talk during meals, we talk shop–about our writing projects, or some other work-related issue that we need help with. We know each other so well, so we can tell someone needs to be quiet. At night we usually talk in the great room of the lodge, often about books, our own projects, and sometimes just about life. We love it that Highlights creates a quiet and private retreat for us in that beautiful place. And the food, of course, is nourishing and delicious." —Deborah Heiligman, award-winning author of Vincent and Theo: The Van Gogh Brothers and many other books for children and teens. Her work ranges from picture books to young adult novels and includes both fiction and nonfiction.